Will the i7 8700K be replaced within the next year? A Eurocom representative over on the notebook review forums has stated that Intel's Z390 chipset will support CPUs with up to 8 cores and 16 threads, suggesting that Intel's upcoming desktop flagship, the i7 8700K, will be made obsolete within the next year thanks to a newer chipset and a larger 8-core CPU. This suggests that Z390 will offer more than just a feature set upgrade over Z370, especially given the fact that the same representative stated that they would be skipping Intel's upcoming Z370 chipset. An eight-core, sixteen-thread CPU will place Intel into a similar position to AMD in the desktop CPU market segment, offering the same maximum core/thread count as AMD's existing Ryzen 7 series of CPUs. 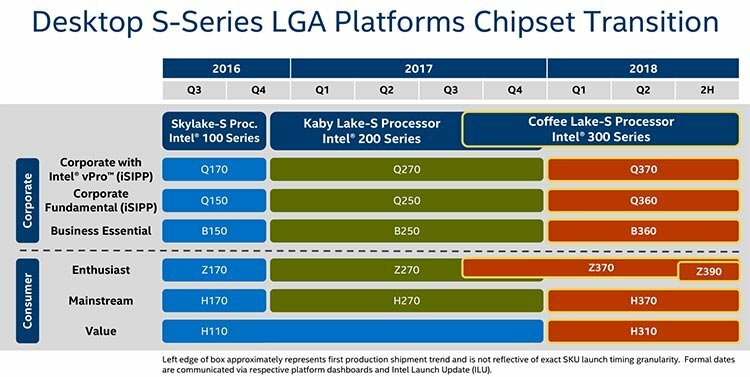 It is possible that Z390 will see Intel release Ice Lake CPUs hit the market, coming on Intel's new 10nm manufacturing node and a true architectural leap over Skylake. Recently leaked roadmaps have suggested that Intel's Z390 chipset will release in the second half of 2018. At this time it is unknown what Intel's Z390 chipset will offer and what feature set upgrades it will feature over the company's existing Z270 motherboards and upcoming Z370 series motherboards. It is also unclear whether or not these motherboards will be using the same LGA 1151 socket, or if Intel plans on doing something completely new with Z390. You can join the discussion on Intel's Z390 socket and rumoured 8-core 16-thread desktop CPUs on the OC3D Forums.